Yesterday we were at a wedding and today I am feeling exhausted and just a little hungover. The apartment is looking very untidy and cluttered and there is a big pile of laundry and dirty dishes in the sink. Sunday is normally my day for catching up on housework. During the week after coming home from work, housework is the last thing I feel like doing, so I tend to leave most of it till the weekend. On days like today though, I'm not feeling very motivated! What I'd rather do.. sit down with a nice cup of Barry's tea (I bring it over from Ireland) and watch the latest X-factor episode! I'm following the UK X-factor this year. Nice to keep some habits even though I live in Germany now! I tried watching a bit of the German Xfactor and I just couldn't get into it. The tea in Germany is awful! If ask for tea in a cafe, nine times out of ten they bring you a glass of lukewarm- not hot- water and a tea bag beside it, and no milk. You put the tea bag in, and the tea barely even changes colour. And then you ask the waitress for milk and maybe after asking them several times, they might remember (customer service is also lacking) and bring you hot frothy milk like the kind you would put in a cappuccino, or else they bring one little container with about 2 drops of milk- like the kind they give you on airplanes. But at home, I can make my tea just how I like it! I think I will do some quick 'maintenance' housework now- a quick hoover, clean the dishes in the sink, tidy the mess from one pile to another, and do a bigger tidier another day. Both me and the fella have similar housework styles- don't do any for a few days, and then do a housework blitz and spend a few hours- this often coincides when we are about to have visitors! During the week, my GerMann often cooks since he gets home from work earlier but then I try to cook weekends. Sometimes I feel inspired on a Sunday and cook something adventurous, like a lasagne, or my speciality chicken and broccoli bake, or maybe I bake some buns or scones. I don't think today will be one of those motivated days! Yes as you have probably noticed domestic tasks are not my speciality! You could say I'm tired after working a 40hour week or you could say I have a lazy streak. Yesterday was a long day at the wedding though (up at 8.30am) and a late night (didn't get home till after 2am) with too much wine, so I think I have earned an easy day today. Next week I'll catch up on the housework I think! Oh how I wish we had a house-cleaner sometimes! It would seem indulgent though since there are only two of us in a relatively small apartment. 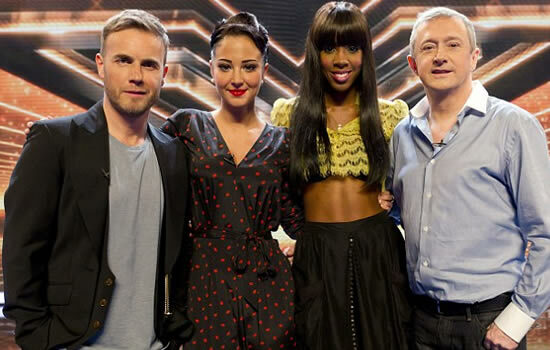 I am really enjoying this year's Xfactor with the new judges. Kelly has a real likeability factor. I find the show tends to make winter more bearable when the days get short and dark too. I used to watch it together with my sister back home, but we can watch it separately now and then discuss it on skype and it's nearly the same! On Sundays my GerMann is always very busy preparing classes for school the next week. It's a hard life being a teacher! I don't envy him! Sundays are therefore my time to meet friends for coffee, skype friends or family back home, study German, mess around on the internet, catch up on housework or just relax and watch my shows. I agree, tea in restaurants is awful in Germany. Never hot enough. Don't stress about the house being clean. Now that I work my house is never clean. Ever. I agree, it is exhausting trying to keep on top of housework while working 40 plus hours a week! But don't forget what they say..
"dull women have immaculate homes!" What sort of expat are you?